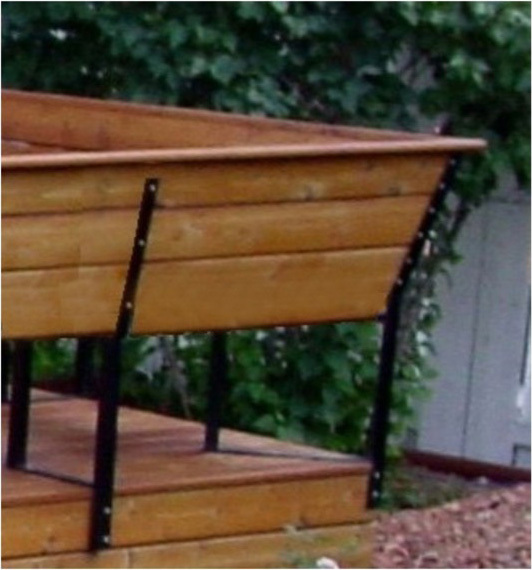 Artistic Iron Works, in Regina, Saskatchewan, Canada is a supplier of easy to assemble, do-it-yourself steel bench brackets and deck seating. Varieties include standard, corner, surface mounting, side mounting, and free standing brackets. 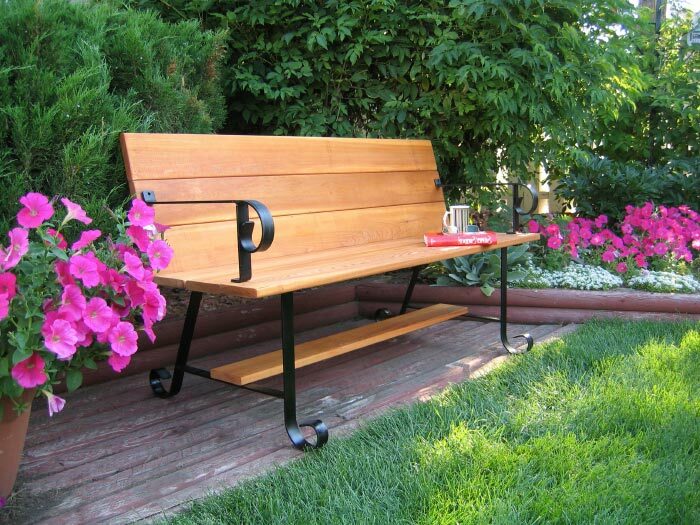 Artistic Iron Works, in Regina, Saskatchewan, Canada is a supplier of easy to assemble, do-it-yourself steel bench brackets and deck seating. Varieties include standard, corner, surface mounting, side mounting, and free standing brackets. 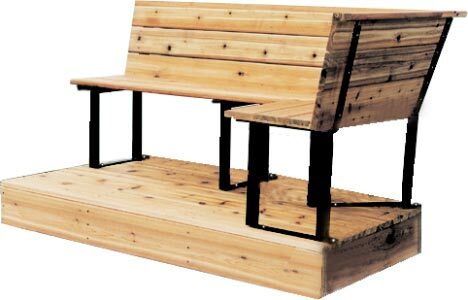 WARNING: Never use bench bracket on a high deck - children may crawl under or over benches - Install a Railing for protection first. Always check with your building inspector or other person with safety construction knowledge. 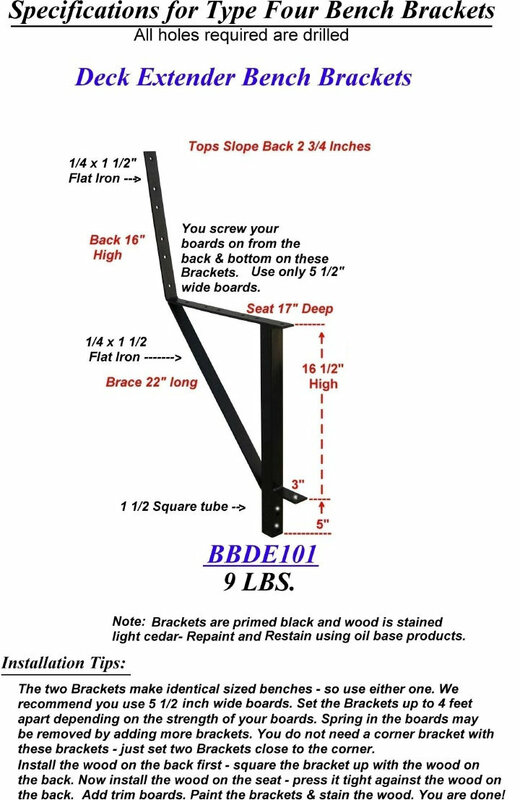 BBDE101 These BENCH BRACKETS bolt to the side and top of your deck and extend over the edge of your deck. This make small decks larger and large decks enormous. You can make a corner without a corner bracket. 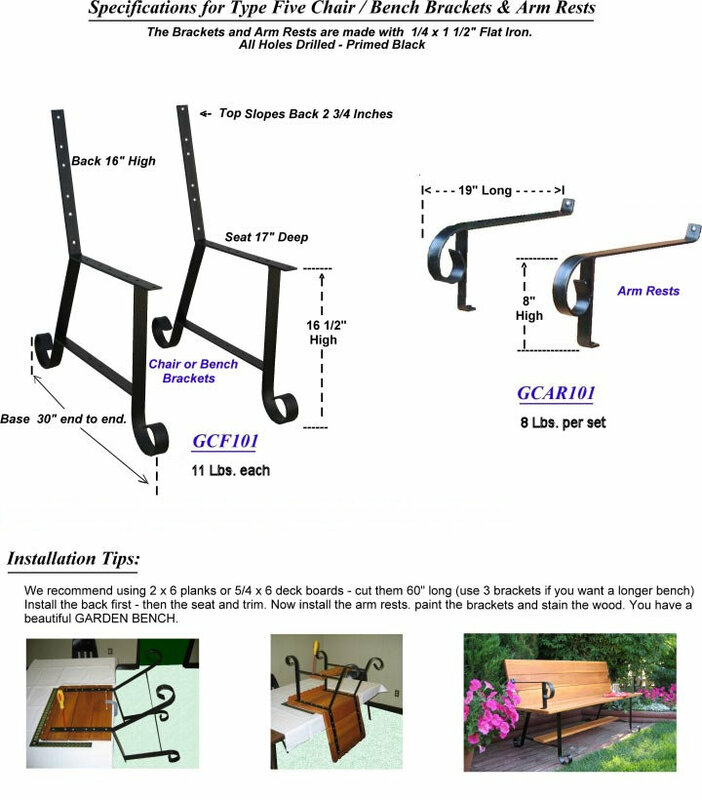 These are strong, durable brackets and are just the thing for smaller decks. Paint is a black primer. 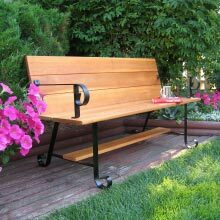 These GARDEN CHAIR BRACKETS make beautiful benches and you can add the ARM RESTS to add even more character to your bench. 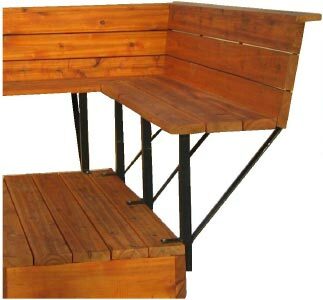 These economical brackets deserve a look for ever portable bench. Primed with black enamel - Paint any colour you want. STANDARD These BRACKETS bolt to the side and top of your deck. 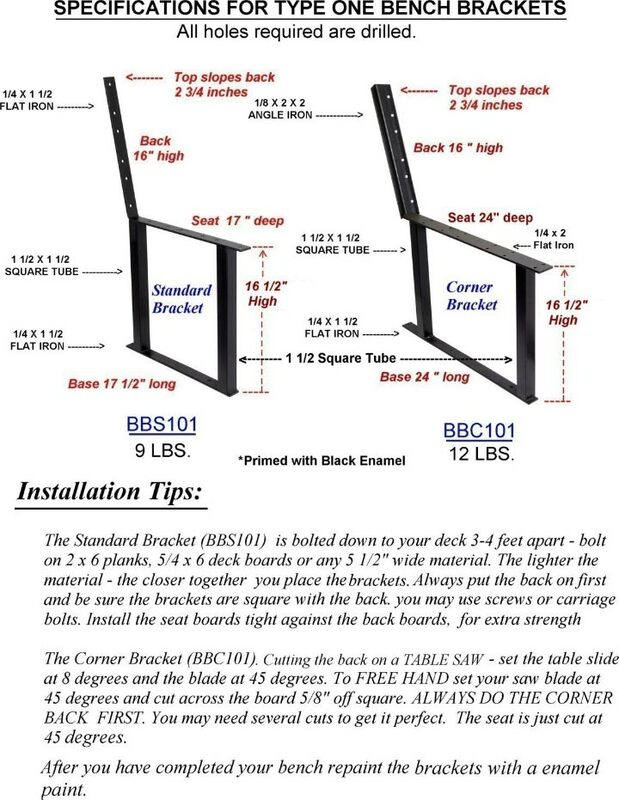 Simply bolt them down and then bolt on 5�" wide boards (2x6 planks or 5/4x6 Deck Boards). 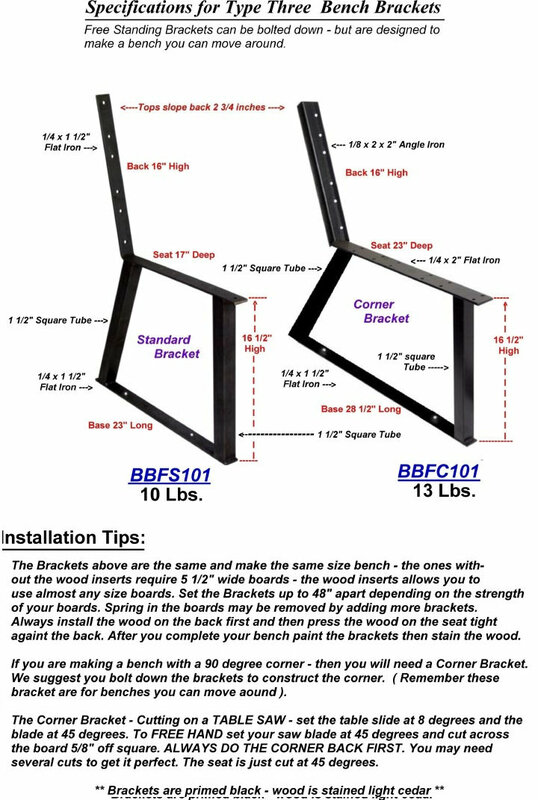 corners are made by placing two brackets as close to the corner as possible and then using corner supports (see Specifications for details). Set brackets 3' - 4' apart. Paint is black primer. STANDARD CORNER These BRACKETS bolt to the side and top of your deck. Simply bolt them down and then bolt on 5�" wide boards (2x6 planks or 5/4x6 Deck Boards). Set brackets 3' - 4' apart. Paint is black primer.